Available with or without platform, single handrail or double handrail options. The Welcome Wheelchair Ramp System has been designed specifically for ease of installation. 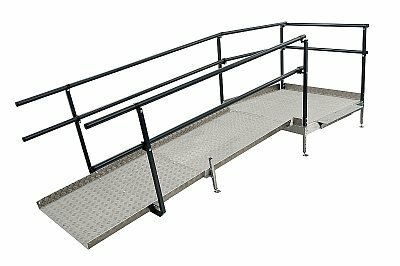 Additional options include; Adjustable height landing platforms, single or double handrails, no handrails, ramp only (without platform). Welcome modular ramps can be put together and taken down in minutes or left up as a semi-permanent ramp option. The Standard Ramp is a single piece lightweight GRP portable ramp. These Wheelchair ramps can be joined together for longer lengths.